The team members all agreed that they worked well together, the combination of their different skills and strengths helped tremendously in the finals. Leong Ching Yip cites the most memorable part of the competition for him was when the group sat down to discuss solutions to the task and the final presentation in front of the judges. 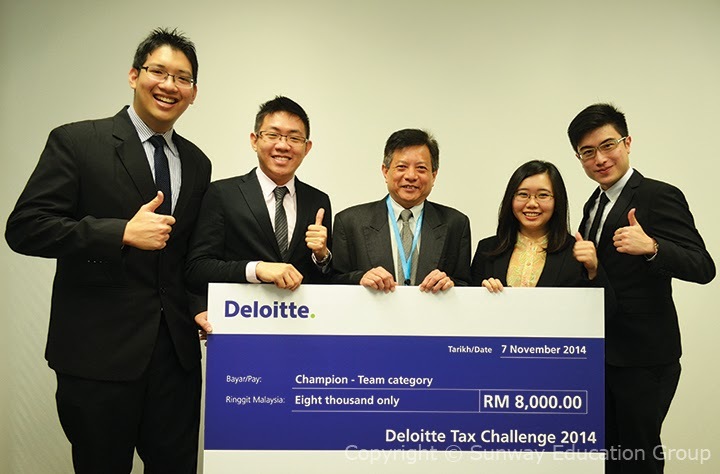 Leong who is looking forward to joining Deloitte in January 2015 as a tax assistant said, “Good teamwork is very important”. Ho Chan Wee explained, “Working in a team is much better as each one has different strengths. Leong has had past experience as he participated in last year’s challenge, Clement has good slide and presentation skills, Esther is good in digging up information and myself good in tax knowledge.” He further expressed that not only knowledge is essential to success as soft skills also play a key role. Clement Yong was also awarded Best Presenter for the Team Category. The four friends currently in the final year and final semester of the ACCA programme at Sunway TES took home a cash prize of RM8,000 in the annual event organised by Deloitte.